Sheffield Hunt Saboteurs use non-violent direct action to stop illegal blood sports in and around Yorkshire and the Midlands. We mainly focus on fox and hare hunting (supposedly illegal in the UK since 2005) but are also involved in campaigns against fishing, shooting, badger culling, Hare coursing, Rabbiting (rabbit hunting) and other forms of hunting. Monitor and sabotage hunts to stop them breaking the law! Close the loopholes of "legal hunting" with direct action. Get in touch and we will arrange for you to come out in the field with us and SAVE LIVES! Send us information on hunts. 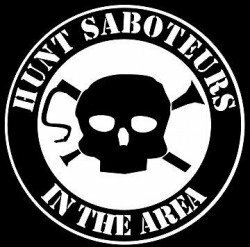 If you can't be out in the field with us, you can support hunt sabs financially. Saving lives costs money. Maps, batteries, video tapes, mobile phone bills, vehicle repairs, fuel etc. all cost money. Maybe you could make a donation. Maybe you could do a sponsored walk or a street stall. Maybe you could organise a benefit gig. Please Email us at sheffieldsaboteurs@live.co.uk for more information or to get involved. or click below to donate.